Book and deposit up to 4 months prior to departure to save on an 8-night stay and explore the beauty of Sri Lanka with an option to extend to Maldives! SRI LANKA LAND ONLY COSTS: First Class $3725 CAD - Deluxe $4075* per person sharing. MALDIVES EXTENSION 5 NIGHTS FROM: $1075 CAD - $3375 CAD per person sharing per night. VALIDITY: December 1, 2018 - October 31, 2019* (Depending on seasonality, departure location and number of travellers). 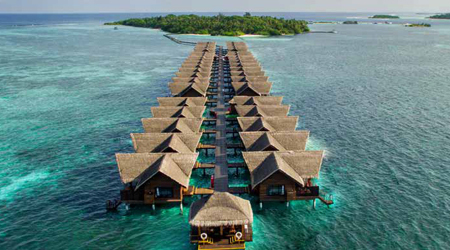 MALDIVES EXTENSION: 5 Nights - Adaaran Resorts. Resort of your choice. ACT NOW! OFFER ENDS OCTOBER 31, 2019! On arrival in Sri Lanka you will be met and assisted by our Airport Representative, who will direct you to your very own guide. Transfer you to Colombo, the commercial capital of the country. Check in at your hotel relax and recover from any jet lag. Colombo – the trade and commercial capital has long been the traditional gateway to the Orient. Sri Lanka’s largest city, it is located on the west coast and draws together all the cultures, religions and influences of foreign lands into a pot-pourri of sounds, smells and a kaleidoscope of colour. The original traders and settlers - the Arabs, Portuguese, Dutch and the British have left in their wake churches and monuments, names and religions, costumes and food and smatterings of their languages which have been absorbed into the speech of the Sri Lankan. Today, Colombo is a fascinating city - a happy blend of east and west, past and present, with a charm of its own. A less known but amazingly true fact is that Colombo has a superb range of high quality restaurants serving food from all over the world and some of the best shopping opportunities in Asia. The main seaport of Sri Lanka is in Colombo and adjoining it, is Pettah, a local bazaar and trading area. Other places of interest are the beautiful Buddhist temples, Hindu temples, mosques, the historic Wolfendhal church, (1749) residential areas where you find the stately homes of the affluent, the Colombo Museum, the Bandaranaike Memorial International Conference Hall, the New Parliament in Sri Jayewardenepura, the Folk Art Centre, Art Galleries, Parks, Independence Square, the Zoo, the Ceramic Corporation famous for its well-known brand “Noritake” and ODEL the renowned shopping centre. Colombo by Jeep is the best option for people who are willing to compromise comfort to try out this new concept of touring to discover the indescribable naturalistic, unseen and untouched raw beauty of Sri Lanka. Take an adventure trip by Jeep that bring together outdoors, nature, wildlife and down to earth people who prefer something different to common sightseeing in an antique World War 2 Jeep with fantastic tours fit every budget that takes one to other worlds, in terms of nature and adventure on private trails. Meet your local driver in the hotel lobby and depart for Habarana, a small village with excellent hotel accommodation and a central location to all the ancient city sites. Arrive and check in at the hotel. In the evening, commence a Jeep Safari in the Minneriya National Park. Minneriya National Park is about 8889 hectares in extent and is an ideal eco-tourism location in Sri Lanka. It is home to Sri Lanka’s favorites such as spotted deer, Sambar, leopards, Sloth bear and elephants. After the breakfast begin the morning by climbing the rock Fortress of Sigiriya - a 5th Century ‘Fortress in the Sky’. Built by King Kassapa the fortress was a Royal Citadel for more than 18 years. Sigiriya, also called as the lion rock (UNESCO World Heritage Site) stands 200 metres above the scrub jungle. The base of the rock is ringed by a moat and rampart and extensive gardens including the renowned water gardens. The majestic Lion’s Paw picturesquely guards the stairway of the palace on the summit. See the famous frescoes of the ‘Heavenly maidens’ of Sigiriya in a sheltered pocket of the rock and the 10 foot high Mirror Wall. 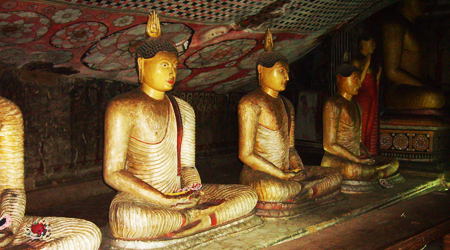 At the foothills, visit the Sigiriya museum as well. Late afternoon proceed to a small farming village, where you will experience the simple lifestyle of Sri Lankan native culture. A Tuk-Tuk ride takes you through the country side up to the river. Here you catch the ferry (a local made catamaran) to cross over to the opposite bank where the local tradition will take place before the dinner. Later a traditional event with blessing session in the night which the guests can be participated with the local artists and give them certificates by the village headman. They will be trained few hours before the event. Thereafter enjoy dinner with selected persons such as village headman, school principal etc., from the village. After breakfast proceed to Dambulla, explore the famous Golden Rock cave temple which has been declared a UNESCO World Heritage Site. A sacred pilgrimage site for 22 centuries, this cave monastery, a vast isolated rock mass with its five caverns is the largest best preserved cave-temple complex in Sri Lanka. The Buddhist mural paintings (covering an area of 2,100 sq. meters) are of particular importance as are the 157 statues including a 47 foot long statue of the recumbent Buddha. Upon completion depart for Kandy, en route visit spice garden in Matale where you can get some interested insights about the spice production in Sri Lanka. Continue on to Kandy, the bustling hill country capital is now a UNESCO World Heritage Site. It is famous for the pink painted Temple of the Tooth which houses the most sacred religious relic, the tooth of the Buddha, the Kandy Lake built in 1807 which is an attractive centerpiece to the town. Later in the evening enjoy the Kandyan Cultural show at the Kandyan Arts & Cultural Centre. The show features the graceful and rhythmic dancers and drummers culminating in an impressive fire walking display. 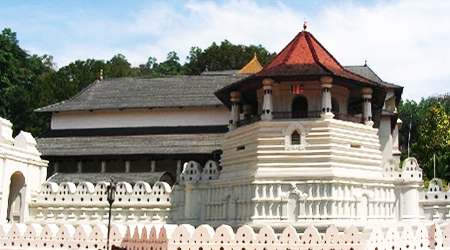 Lastly, visit the sacred Temple of Tooth Relic. Monks conduct daily worship in the inner chamber of the temple. Rituals are performed three times daily: at dawn, at noon and in the evenings. On Wednesdays there is a symbolic bathing of the Sacred Relic with an herbal preparation made from scented water and fragrant flowers. This holy water is believed to contain healing powers and is distributed among those present. After breakfast visit the Peradeniya Botanical Gardens where a rare collection of tropical exotic and indigenous flora including the famous Orchid House could be viewed. It is about 5.5 km to the west from the city of Kandy in the Central Province of Sri Lanka. It attracts 2 million visitors annually. It is near the Mahaweli River (the longest in Sri Lanka). It is renowned for its collection of orchids. The garden includes more than 4000 species of plants, including orchids, spices, medicinal plants and palm trees. Attached to it is the National Herbarium of Sri Lanka. The total area of the botanical garden is 147 acres (0.59 km2), at 460 meters above sea level, and with a 200-day annual rainfall. It is managed by the Division of National Botanic Gardens of the Department of Agriculture. Upon completion commence a city tour of Kandy: take an upper-lake ride to the top of the hill where a bird’s eye view opens of the city below, drive around the man-made Kandy Lake known as the Milky Ocean, visit the gem museum, the colossal Bahirawakanda statue and the Kandy Garrison Cemetery. 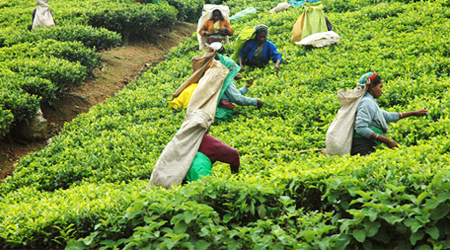 Leave for Nuwara Eliya, en route visit a tea plantation and a tea factory, where you will get the opportunity to see the fine mechanism of processing world class Ceylon tea. Nuwara Eliya, the heart of the Central Highlands of Sri Lanka. Set in the heart of Tea country and situated 1890 meters above sea level, Nuwara Eliya provide home for the best quality Ceylon tea. Check in at your hotel and spend the evening at leisure. On arrival continue to explore the beautiful town of Nuwara Eliya. The city resembles an English countryside with the building architecture of Georgian to Queen Anne. At your convenience commence a sightseeing tour of the city. Visit the Nuwara Eliya Town, Market place, Golf Course, (one of the finest 18 holes Golf courses in Asia) the Hill club, and drive around this hill station viewing Lake Gregory. After breakfast proceed to Nanu Oya station and you will catch the train (driver leads you to the wagon and finds your seat for you and hurriedly makes his way to the Ella station by car to meet you on arrival). Driver picks you up at the station and transfers you to Ella. Proceed to Ella. Ella is a picturesque hill side town situated in the middle of Sri Lanka, surrounded by beautiful mountains, tea plantations, and numerous varieties of flora and fauna. With a cool climate, marvellous views, and several things to do and see, Ella is fast becoming a favourite destination for travellers. Commence a sightseeing tour around Ella. Ella is a great location for viewing some of the best natural scenery in Sri Lanka. The Ravana Ella Falls is a wonderful sightseeing attraction. Ranks as one of the widest falls in Sri Lanka, the waterfall measures approximately 25 meters (82 ft) in height and cascades from an oval-shaped concave rock out crop. The falls form part of the Ravana Ella Wildlife Sanctuary. View the Ravana falls and other attraction from the road. Upon completion leave for Yala, the most visited and second largest national park in Sri Lanka. Yala National park one of Sri Lanka’s premier eco tourist Destinations and is renowned for its variety of wildlife notably its many elephants. It is also home to the spotted deer, sambar, wild buffalo, sloth bear, jackal, mongoose and crocodiles. The peacock is easily the most famous of the birds in this park. Yala has one of the highest leopard densities in the world although seeing these nocturnal carnivores still requires some luck. On arrival in Yala, check in at the hotel and spend the rest of the day at leisure. On this day enjoy a morning and an evening jeep safari in the Yala National Park by a private jeep accompanied by a tracker. After breakfast leave for Galle, the capital of the southern province with a colorful history. Visit Galle Fort. The historical Dutch Fort in Galle which spans over 90 acres of land was first built by the Portuguese Invaders, but later many features were added by the Dutch Invaders in 1663. This Fort was declared a UNESCO World Heritage Site in 1988. There are many important buildings within the territory of the fort, the Dutch Museum for example. Galle is renowned for hand loomed lace work, for traditional hair combs made out of turtle shells and wooden carvings of elephants made of expensive ebony wood. On completion enjoy a traditional cooking session at a local house. Sri Lankan traditional cooking techniques take their best form in the southern part of the island. The cuisine relies heavily on the core ingredients of coconut, vegetables, rice, fresh chillies, spices, and curry leaves, all of which grow in abundance on this part of the island. Spend the day learning how to cook a traditional Sri Lankan meal and enjoy lunch with the family. At your convenience commence a city tour of Galle, southern province with a colourful history. Visit Galle Fort. The historical Dutch Fort in Galle which spans over 90 acres of land was first built by the Portuguese Invaders, but later many features were added by the Dutch Invaders in 1663. This Fort was declared a UNESCO World Heritage Site in 1988. Rise early morning and leave for Mirissa, a small sandy tropical beach village which boasts some of Sri Lanka’s most stunning sunsets and sunrises. It is also on the worlds 'Top Hot Spots' for Sperm and Blue whale sightings. In the warm Indian Ocean you can see Blue whales, Sperm whales, Common dolphins, Bottlenose dolphins, Spinner dolphins, Risso's dolphins and striped dolphins. Take the boat from the fishery harbour out to sea. Blue Whales in concentrations not seen elsewhere in the world would be the highlight. After seeing the blue whales, your naturalist will take you further out to sea to look for sperm whales. 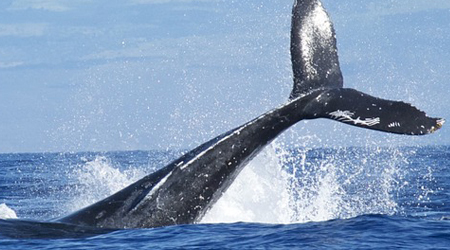 Whale watching season starts in November and ends in April. Ocean is warm and calm during these months. Sometimes we can see whales even in October and after April but ocean can be rough. Boat leaves from Mirissa harbor at 6.30 o´clock in the morning and the tours last 3-5 hours (depends on spotting of whales and wish of our passengers). Afternoons are the ocean usually rough and not suitable for whale watching. Swimming with the whales and dolphins is not permitted. After the tour you will be transferred to the international Airport in time for your flight home or Extend your trip to Male. 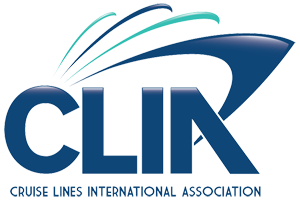 Meeting on arrival and transfer to your resort. Day is at leisure for independent activities. Check out and you will be transferred to the airport by sea plane or water taxi to board your departure flight. 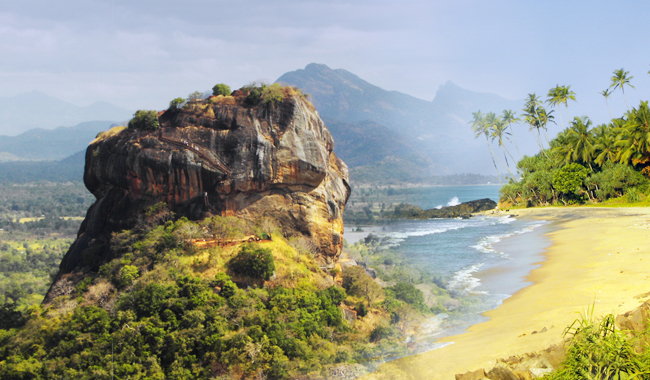 Interested in Save $100 Exploring the Beauty of Sri Lanka with Tourcan Vacations?